CARICOM is an organisation of 15 Caribbean states that promotes economic integration and cooperation between its members. It is involved with coordinating economic policies, development plans, and devising plans and projects to benefit the less developed members of the organisation. In 2001, the Community signed a treaty to begin to develop a Caribbean single market and economy. Part of it is the creation of a Caribbean court of justice. Caricom is a direct decendent of the ill-fated Federation of the West Indies. 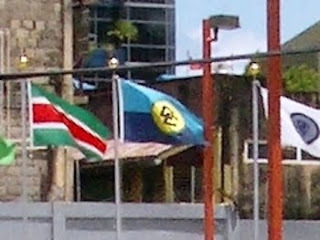 Later, the English speaking nations in the Caribbean formed the Caribbean Free Trade Association, which was superceded by CARICOM formally in 2001. The flag itself is a horizontal bi-colour of light and dark blue, with a yellow disc in the centre, with 2 interlocking "C"s placed upon it.